Located right at the entrance of the National Park Manuel Antonio, our hostel offers you the best option to enjoy the Pura Vida we have in Costa Rica. Nine spacious and comfy bedroom with terrace, private bathroom, air conditioner and cable TV surrounded by a beautiful nature and wild beaches perfect to swim and enjoy the sun. With private parking, we will offer you all the facilities you need to make the most of your time in this perfect spot of nature, mix of jungle and beach. 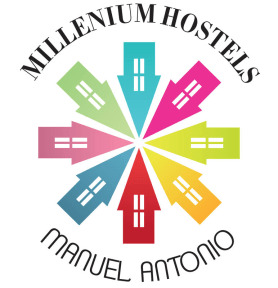 Supermarkets, bank and restaurants around, complete the surroundings of our hostel. Manuel Antonio was Costa Rica’s first major ecotourist destination and remains one of its most popular. 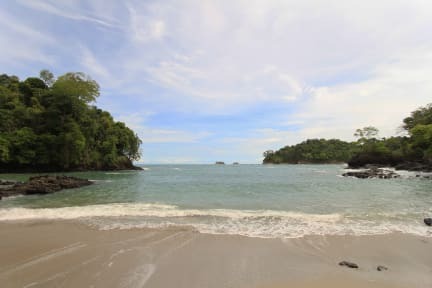 The views from the hills overlooking Manuel Antonio are spectacular, the beaches (especially those inside the national park) are idyllic, and its rain forests are crawling with howler, white-faced, and squirrel monkeys, among other forms of exotic wildlife. You won’t find a better location in the area. We are located 20 meters from the entrance of the National Park Manuel Antonio, with incredible wild beaches around. Apart from it, Playa Espadilla is just 2 minutes walking from here, and we are surrounded by supermarkets and many options to entertain yourself. All our bedrooms are equipped with air conditioner, cable TV with LCD screen, private bathroom and terrace. The bedrooms are quite spacious and comfortable. Check in from 14:00 to 20:00hs. Breakfast not included - 6.00 USD per person per day. The reception is open from 07.00 to 22.00.